Здесь представлена один из разделов седьмой главы каталога, сопровождавшего выставку работ художника эпохи Возрождения Фра Анжелико (15 век) в Музее искусств Метрополитен в Нью-Йорке в 2005 году. Каталог составлен кураторами этой выставки Лоуренсом Кантером и Пиа Палладино. In first calling scholarly attention to this panel — intimate in scale and so loose and impressionistic in handling as to blur the distinction between a brush drawing and a finished painting — Luciano Bellosi speculated that it might originally have decorated a painted reliquary or the base of a paschal candlestick such as those described by Vasari as having been executed by Angelico for Santa Maria Novella. (*4) The vertical wood grain and relative thinness (1.2 centimeters) of its panel support suggest, instead, that it is likely to be a fragment of the wing of a triptych. That it has been trimmed in width may be deduced from the glimpses of arches springing to either side of the crossing piers and, at the left, the oblique view of an altar table in the lateral chapel, gratuitously cropped at the edges of the panel. The angle at which the lateral altar table was meant to be seen, as well as the fact that the left wall of the apsidal chapel is visible but not the right wall, may imply that the painting was conceived for the left wing of a triptych, to be viewed off-center and to the rights. 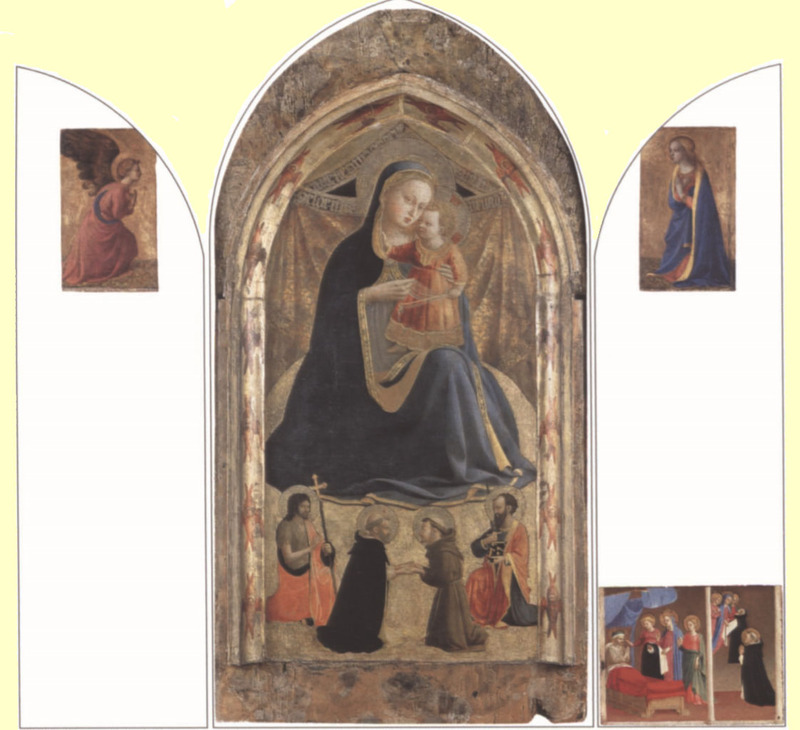 (*5) As it is impossible to determine how much the panel has been reduced in width, or whether it was originally enclosed within an engaged frame, it is difficult to estimate the dimensions of the center panel or of the matching wing on the right of this hypothetical triptych. The unique subject of the present panel does imply that the complex must have been devoted to specifically Dominican imagery, and perhaps that its patron was a particularly erudite member of the Dominican order. 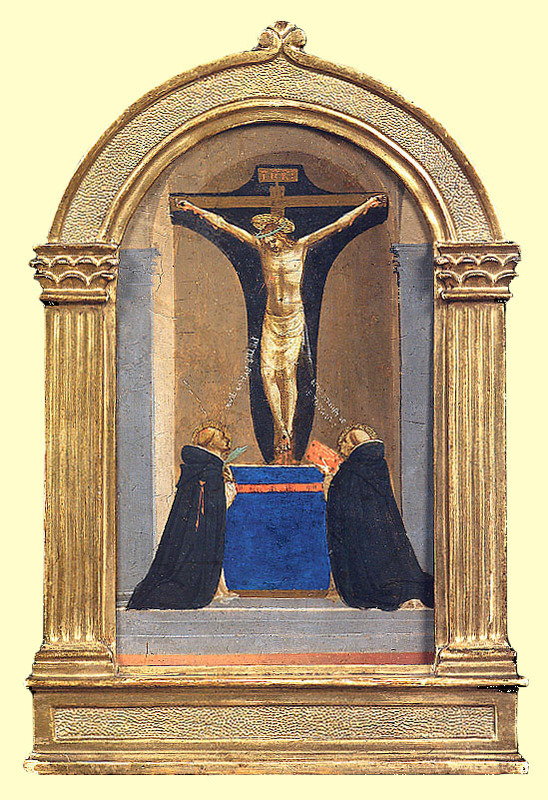 One such Dominican triptych painted by Angelico (cat. 21), probably about 1427, is inappropriately large and too early in style to be associated with the present panel, for which Bellosi proposed a date in the early 1430s, not far removed from what he believed to be its compositional model: Masaccio's Trinity fresco in Santa Maria Novella. The clarity, precision, and symmetrical balance of the architecture in this panel, as well as the tangible evocation of atmosphere created by its subtle light effects, preclude so early a date, however, and argue instead for placing it significantly later in the artist's career, after he completed the frescoes in the upper corridor at San Marco and possibly as late as the Annunziata Silver Chest of 1448-50. The attenuated figure types and loose, sketchy handling of paint also suggest a dating toward the end of the artist's activity, if perhaps not as late as the Christ on the Cross with the Donor, Cardinal Torquemada, now in the Fogg Art Museum (cat. 39). Музей Искусств Фогга, Музеи Гарвардского Университета, Кембридж. Массачусутс. No other paintings from this stage in Angelico's development can be identified that might be directly associated with this one, but the fact that the present panel has been known to scholars for less than a decade raises hopes that others like it may soon reappear as well. (*1). Bellosi and Galli 1998. (*2). Aria Sanctorum, Mar. I, Dies 7, s.v. "S.Thornas Aquinas, Doctor Angelicus Ordinis Praedicatorum," Caput VI, 35. (*3). Ada Satictorum, Apr. III, Dies 29, s.v."S. Petrus Martyr, Ordinis Praedicatorum," Caput I, 6. (*4). Vasari (Milanesi ed.) 1878-85, vol. II, p. 513. (*5). Similar adjustments to perspective in triptychs by Duccio presuppose an angle of opening for the wings rather than their being read as on the same plane as the center panel. If this were the case here, as well, the present panel would have appeared to the right, not the left, of the center panel.